Our birdseed has been disappearing from the feeder at an alarming rate, and I’d been blaming the grackles for it. They’re ALWAYS on the feeder and scaring the other birds away. But Friday night, I spotted this little fella. He climbed that pole so easily I know he’d done it before. 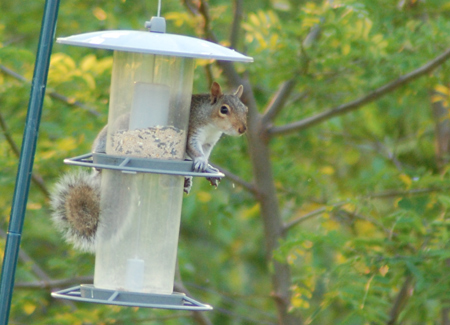 Guess this means I’ll have to buy a squirrel feeder so he’ll stop using this one. That’s a wicked cheap pole and it’s not in the ground particulary well (we’re on sand, so nothing really ‘sticks’ ). He must be the reason its at a 45 degree angle now. There’s no way the grackles are that heavy. I tried to be mad at him, but it wasn’t possible. How could you be angry at a face like this?